Back to index of science and math pages by Donald Sauter. For the first time anywhere, ever . . .
Have you ever seen such a mess in your life? Stupid me. Of course you have; you've never seen anything else. Well, it's your lucky day, because, after who knows how many centuries of mathematical advancement by the world's most brilliant minds, today I will teach you how to subtract. I hesitate to even call it a "method" since it's so basic that it's hard to imagine any other way of doing it. I mean, you wouldn't call depositing food in your mouth a "method" of eating, would you? Before we get started, consider a little story. You were given directions to your friend's house. You were told to "turn on Minuend Street," but not which way to turn. When you get to Minuend Street, you find there is only one possible way to turn, let's say right. Now, do you throw on the brakes; pull out the directions and a pencil; scribble in, "Turn RIGHT on Minuend Street! "; put the paper and pencil away; and fire up the car again before proceeding to turn right on Minuend Street? Or, would you simply turn right on Minuend Street, the only way to go? If the analogy with subtraction doesn't become clear, then I will have failed miserably. Let's take a sample problem that is a little meatier than any of those shown above. You will subtract place by place, from right to left. In each place you will find either the "good" case or the "bad" case. The "good" case is when the digit being subtracted is smaller than (or equal to) the digit above it. The "bad" case is when the digit being subtracted is bigger than the digit above it, in which case you view the digit above as being up in the "tens". So, for example, a 5 on top is either a 5, if 5 is big enough, or a 15, if it's not. Simple? If you've just processed a "bad" case, then, when you move to the next place, the digit on top chunks down by 1. The process moves quickly and easily. Everything is so "right there" in your head, that it would actually be disruptive to stop to scribble in the familiar subtraction graffiti. Admittedly, 0's on top are a little scarier. Just remember that a 0 chunks "down" to 9. (I'm assuming, if you're here, you've mastered counting.) And that when you "borrow" through a string of 0's, they all turn to 9's, and the digit to the left of the 0's chunks down by 1. 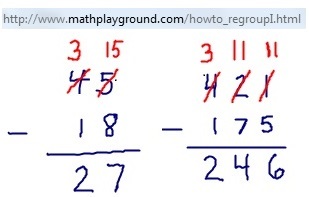 Yes, this can all be proven with "regrouping" theory, but do you need to lug the proof along in every subtraction problem till the end of time? When you take a derivative, do you start from the definition every time? In the sample problem you will see somebody's thumb blocking out everything to the left of the place you're currently at. I am NOT suggesting you actually use your thumb to cover the digits to the left. I am just driving home the point that all that stuff to the left has no bearing on what you're doing at the moment. You will get to it when you get to it. Examine the digits in the rightmost column. Think: It's either 7 minus 9, or 17 minus 9... And it ain't 7! Move to the next place. Think: That was the "bad" case, so 5 chunks down to 4. 4 minus 2? Go for it! Think: That was the "good" case. This is either 4 minus 8, or 14 minus 8... And it ain't 4! Think: That was the "bad" case, so 0 chunks down to 9. 9 minus 3? Go for it! Think: Even though that felt like the "good" case, we don't forget we borrowed "through" a 0. The 6 chunks down to a 5. 5 minus 1? Go for it! And, hey, looky there! You can still see the original problem! Class is dismissed, but if you've stuck around to tell the teach, "Caught'cha! You swear in your other web pages that all of math is just addition and multiplication, and here you devote a whole page to subtraction! Ha! ", I say hold your horses. If you would just slow down and take a peek inside your brain while stepping through this, or any, subtraction problem, you would see you actually accomplish it with addition skills. For example, for 17-9, you don't count back by 9, but view the gulf between 9 and 17 and ask yourself, 9 plus what gets me to 17? You might have that addition fact hard-wired, or you might do it in a few lightning steps: 1 gets you to 10, and then 7 more to 17; 7+1=8. Or, you might do the big step first: 17 is 7 beyond 10, plus 1 more to get back to the 9; 7+1=8. 4-2? You know instantly that two 2's are 4. 14-8? Again, you don't step back by 8; you ask, 8 plus what gets me to 14? 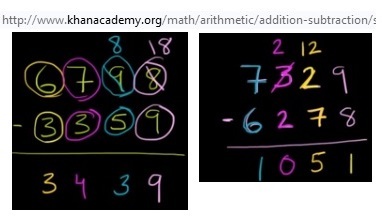 And this gives me the opportunity to drive home the further point that all of math is accomplished with single-digit addition and multiplication. Here we had a problem soaring in the tens of thousands, and the scariest math our brain had to contend with was 9+8 and 8+6. Anyone in the math education establishment listening? Helpful keywords not in the main text: mathematics; subtrahend; difference.